Pune, 1st September 2018 – Innovecture inaugurated today its new Innovation and Development Center to launch new Digital Products as well as to provide software product development services to clients worldwide. Innovecture will employ about 50 Software Engineers in this state-of-the-art facility located at Aundh, Pune. The Innovation and Development Center will launch new products in the mobile technologies, Internet of Things (IoT), Artificial Intelligence and Digital Customer Experience space. This facility will also provide development services to its Fortune 500 clients in the North America and Europe region. At the inauguration, Shreyas Kamat, Chairman and CEO of Innovecture Group, said, “This is an important milestone for Innovecture which will provide significant boost to growing our global footprint. With innovation deeply rooted in our culture and excellence embedded in our development services, we are confident that we will replicate our success in the North America region here in the Asia/Pacific market and will also take the innovation in India to the next level”. Further, Shreyas added, “We aspire to expand Innovecture globally to UK, Japan and Canada over the next couple of years and we expect Innovecture India to be an innovation and operational hub for all our global operations”. 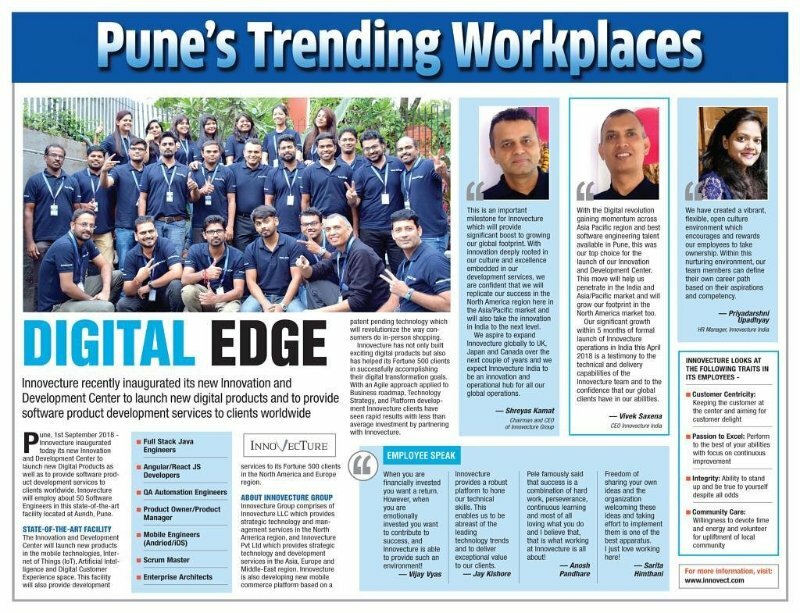 At the inauguration Vivek Saxena, CEO Innovecture India, said, “With the Digital revolution gaining momentum across Asia Pacific region and best software engineering talent available in Pune, this was our top choice for the launch of our Innovation and Development Center. This move will help us penetrate in the India and Asia/Pacific market and will grow our footprint in the North America market too”. Further, Vivek added, “Our significant growth within 5 months of formal launch of Innovecture operations in India this April 2018 is a testimony to the technical and delivery capabilities of the Innovecture team and to the confidence that our global clients have in our abilities”. Innovecture Group comprises of Innovecture LLC which provides strategic technology and management services in the North America region, and Innovecture Pvt Ltd which provides strategic technology and development services in the Asia, Europe and Middle-East region. Innovecture is also developing new mobile commerce platform based on a patent pending technology which will revolutionize the way consumers do in-person shopping. Innovecture has not only built exciting digital products but also helped its Fortune 500 clients in successfully accomplishing their digital transformation goals. With an Agile approach applied to Business roadmap, Technology Strategy, and Platform development Innovecture clients have seen rapid results with less than average investment by partnering with Innovecture. Visit www.innovect.com for more information. Vijay Vyas, said,” When you are financially invested you want a return. However, when you are emotionally invested you want to contribute to success, and Innovecture is able to provide such an environment! Jay Kishore, said,” Innovecture provides a robust platform to hone our technical skills. This enables us to be abreast of the leading technology trends and to deliver exceptional value to our clients”. Anosh Pandhare, said, “Pele famously said that success is a combination of hard work, perseverance, continuous learning and most of all loving what you do and I believe that, that is what working at Innovecture is all about! Sarita Himthani, said, “Freedom of sharing your own ideas and the organization welcoming these ideas and taking effort to implement them is one of the best apparatus. Innovecture is hiring aggressively in the US and India market. If you want to be a part of this exciting journey, please connect with us at careers@innovect.com for the following roles.